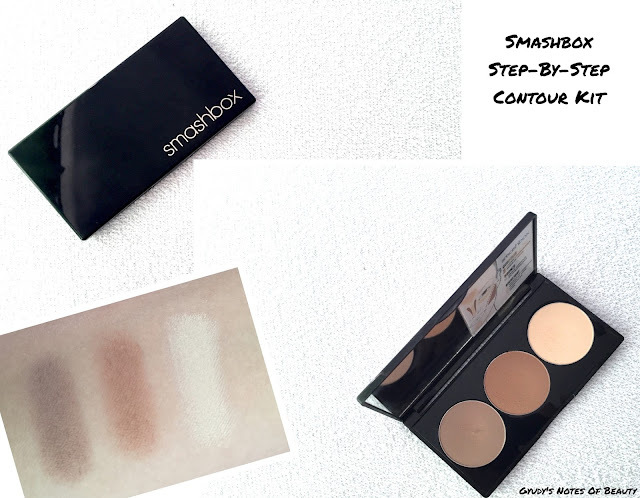 There’s a product I’ve been loving that I never see mentioned on blogs, and it’s the Smashbox Step-By-Step Contour Kit. If you follow me on Instagram you’ve seen me feature it in almost every single “face of the day” post, and that’s the truth, as I’ve been wearing it nearly everyday for months. The little compact contains a contour powder, a shimmer free bronzer and a highlight that is matte too. The texture of these powders is incredible: they blend super easily and never look patchy. I love how the pigmentation is strong enough to show up but not too strong, as it allows me to go for a softer or stronger look with ease. They layer well and they even blend well on not powdered (but allowed to set) foundation if needed. I usually only contour my cheeks, and this trio is perfect for that. I apply the contour shade right on and slightly under my cheekbone, blending upwards. Then I follow with the bronze shade, right above the contour, and then apply the highlight shade on the top of my cheekbone. It’s perfect for a shimmer free highlight and sometimes I use it under my eyes too, as if anything it has a slight yellow tint that looks wonderfully brightening. I then follow with blush (creams pair well with this trio too) and, if I want, a shimmery highlighter too. I forgot to photograph it, but the palette comes with an amazing angled brush that I use for all the shades, and you can see it on their website here (I've just seen they feature a dark shade too if you're interested). Since I started using this I haven’t felt the urge to take out of the drawer any other contour powder, let alone buying new ones. It’s pure love. A trio of shimmer free super smooth powders that are foolproof to apply, with the perfect brush included? I really don’t need to look any further. Have you tried this Smashbox Contour Kit? What is your favourite contour product?